Heading into finals week, men’s basketball won a huge tilt against Williams and was riding a seven game winning streak. Since then the team has played streaky basketball. First, they were challenged by five out-of-conference games. Then, they entered the meat of their season with seven NESCAC games to complete their 12-game vacation slate. After their shortened Christmas break, Wesleyan participated in the Salem State Holiday Classic. They drew Elmira College in the first round, which did not prove to be a difficult matchup. The Cards took a 91-56 victory, despite an off game from Davis in which he scored just eight points on four of eight shooting. Krill’s 16 points led the way, while Kuo, Harry Rafferty ’17, and Joe Edmonds ’16 also reached double-digits. In the tournament’s championship round, the team took on the host, Salem State University. By halftime, Wesleyan already led by 26, and they cruised to a 91-60 win to capture their second tournament of the season. Davis bounced back with a 17-point effort, which was matched by Kuo. Krill continued his streak of strong play with 13 points and nine rebounds. This win brought Wesleyan’s win streak to double digits, their longest single-season streak since 1912’s undefeated campaign. After New Year’s, the team visited Rhode Island College in their last chance to bolster their record before their NESCAC slate. After controlling most of the game, Wesleyan blew a lead in the last two minutes and Davis’ missed attempt at a game-winning jumper sent the Cards into their first overtime of the season. Rhode Island fell behind quickly and narrowly failed at their comeback attempt with Wesleyan emerging as the 79-77 victors. The next games proved challenging for Wesleyan. The Cards dropped their second game of the season to Middlebury in a fairly lopsided 86-76 contest, despite a seven-point halftime lead. The following night, Hamilton forced the Redbirds into overtime despite owning the NESCAC’s worst record. Wesleyan relinquished a halftime lead and Davis missed a clutch time shot, but they gained a quick overtime lead which they managed to retain. When the buzzer sounded, the score was 82-76 in favor of the Cardinals. Despite these comparatively poor team performances, Davis maintained overall strong individual play. 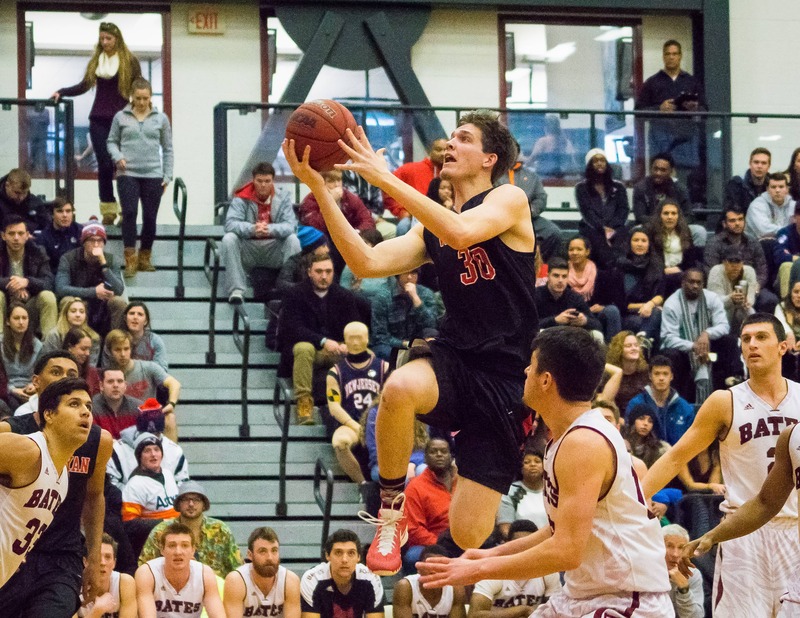 The following game against Amherst showed how important his presence is to Wesleyan’s offense. He was held to just two points, and Wesleyan shot a dismal 21 percent from the floor on the way to a 66-40 loss, its worst performance of the season in many respects. The following night at Trinity was equally unimpressive, as Wesleyan forfeited another halftime lead in a 76-62 loss. Davis’ eight points were third-most on the team to Kuo’s 10 and Epps’ 17. Wesleyan desperately needed a change of pace in another matchup with the formidable Amherst squad, which they were able to accomplish. Scoring remained a problem for Davis. He had an eight-point game, but the team was buoyed by Epps’ 17. Amherst shot just 13 of 63 on their way to 44 points, and the Cards raced to a resounding 71-44 victory. Desperate to prove that the previous win was not a fluke, Wesleyan hosted Tufts the following weekend. At the half, the Cardinals trailed by five. However, they made up the deficit and forced overtime with a pair of clutch free throws from Davis. As the back-and-forth overtime came to a close, a layup from Kuo put the home team ahead for good, and secured a 78-77 victory. The final game of winter break was at home to Bates. Rafferty dominated the first half with 11 points on three treys and sent Wesleyan into the locker room with a 16 point lead. Despite taking their foot off the gas a bit in the second half, the squad still managed an easy 82-67 victory. This concluded Wesleyan’s break, and brought their season record to 14-4. The team faces Conn College Saturday night, then ends its out-of-conference schedule on Monday at Emmanuel College. After that, it has just three games remaining to improve its seeding for the NESCAC tournament.